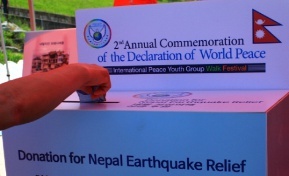 The ‘2nd Annual Commemoration of the Declaration of World Peace 2015’ and ‘International Peace Youth Group Walk Festival’, 5.25 HWPL Peace Day, all of the participants prayed for victims of Nepal Earthquake and a donation booth titled “The Path of Bringing Cheer to Nepal” was opened. Photo exhibition for sharing current situation of the victims, writing a message of hope, fund-raising indicated the ideology of HWPL that is to break the wall of boundaries, religions, societies and races and embrace love as one family. On June 22nd, at the Peace Palace in Goseong, Gangwon Province, South Korea, a delivery ceremony of Donation from Korean headquarters of HWPL was held. The donation was raised during the 2nd Annual Commemoration of the Declaration of World Peace hosted by Heavenly Culture, World Peace, Restoration of Light (HWPL). 19,313 international members of HWPL donated about $ 40,000 which will be officially delivered to Nepal through the Embassy of Nepal to South Korea. During the event, Chairman Man Hee Lee of HWPL, feeling for the situation in Nepal delivered the donation to KAMAN SINGH LAMA, Embassy of Nepal to South Korea with a warm message wishing restoration and relief of the nation. Ambassador KAMAN SINGH LAMA expressed his gratitude toward Chairman Man Hee Lee and his relief activities for Nepal as well as to the members of HWPL for their endless attention and efforts to bring forth peace with all hearts. The ‘2nd Annual Commemoration of the Declaration of World Peace 2015’ and ‘International Peace Youth Group Walk Festival’ was a grand event that took place in 30 countries worldwide, with participation by 200,000 youths and women through 43 branches including United States, Sweden, Bulgaria, India, Thailand, Cambodia, Philippines, etc. and 21 major cities in Korea. On the day, all of the participants prayed for victims of Nepal Earthquake and a donation booth titled “The Path of Bringing Cheer to Nepal” was opened. Photo exhibition for sharing current situation of the victims, writing a message of hope, fund-raising indicated the ideology of HWPL that is to break the wall of boundaries, religions, societies and races and embrace love as one family. Not only in Republic of Korea but also in Australia, New York, Netherland and San Francisco donation booths for Nepal were promoted. Nepal and HWPL has another event that made special bond between them. On April 11th, “World Alliance of Religions’ Peace (WARP) Office was held in Kathmandu, Nepal and about 150 participants from various religious backgrounds including Hinduism, Buddhism, Sikhism promised to work with HWPL.